I am excited to share my feature on ForHarriet.com as a part of it's Black Girls Blogging series. Black Girls Blogging is a new feature on For Harriet that explores the ways Black women share their voices and build community online in a social media sphere that provides them opportunities to define who they are and what they hope to become. 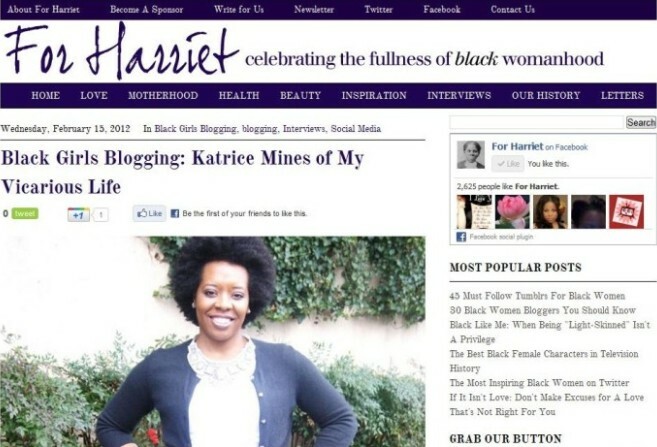 ForHarriet.com is a blog community for Black women 25-65 run by its publisher and editor-in-chief, Kimberly N. Foster. In an effort to provide new, diverse perspectives on what it means to be a Black women in the 21st century, our content is written primarily by women who do not consider themselves to be writers or academics. We encourage our readers to share their opinions and engage in honest, open dialogue about the issues that affect our lives. All opinions are welcome except those which promote hate, intolerance, or oppression. Our mission is to inspire, educate, and entertain our readers. Congrats! I learned a bit more about you and can definitely see your blog blossoming even more. Your answers actually gave me some things to ponder about blogging. Congratulations!!! So excited for you ... and BTW, I'm back :-)!!! : ))) Thank you, Sabrina! So glad you're back.